For today's special feature, I bring you FrankenThumb! It's even sporting some light pink nail polish over here. You should feel very honoured by its presence. Okay it's not so franken at the moment, but that poor thumb gets cut or otherwise mangled a *lot*. But FrankenThumb or no FrankenThumb, my love for meatballs just does not falter. These bypass the usual suspects of beef or pork and instead makes use of chicken. 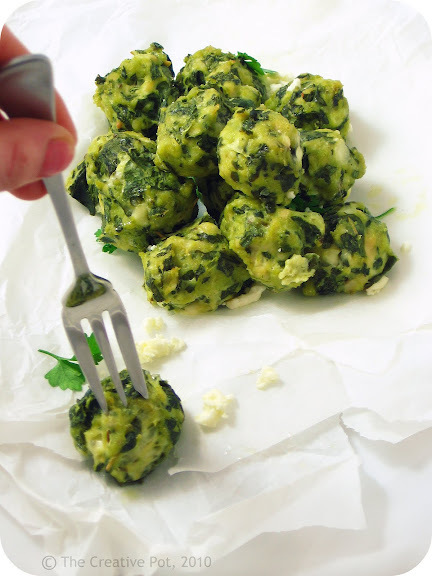 Add a few handfuls of a large bunch of spinach, a couple of herbs and some salty feta and you've got yourself a deliciously light salty little morsel. Bursting with the bold flavours of the Greek islands. Now you just need a bronzed Greek god/goddess and you're good to go. 1. Using a food processor, finely shred the spinach. 2. Mix everything together in a large bowl, then form into small balls using your hands. 3. Place in a steamer and steam for 5 - 10 minutes or until almost cooked through. 4. Transfer to oven dish and quickly grill for a few minutes to brown slightly. Alternatively you can just pop these babies in the oven at 180C (350 F) for about 20 - 30 minutes or until cooked through and browned on top. 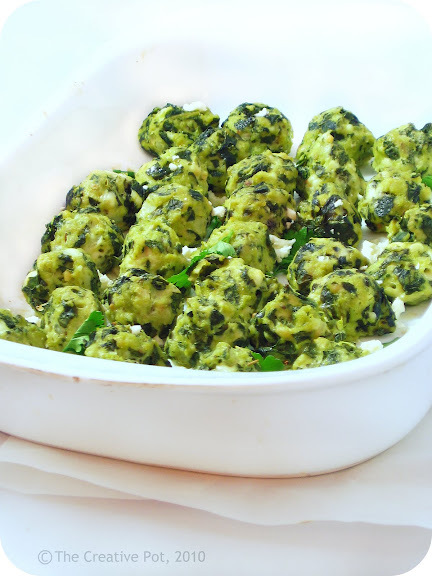 Serve with a big green salad and sweet cherry tomatoes. Alternatively, use them as stuffing for pitas with tzatziki sauce and fresh lettuce. *Now, if you're like me, you probably won't find chicken mince in the shop, but it is super easy to buy the skinless boneless fillets and just chop it up finely in your food processor. In fact, I actually prefer it this way, least I know what goes into my mince! I like it a lot. There is so much you can do with these babies. Mind if I try them? This is something I have never eaten but it definitely looks very nice. This might just be a way of getting the little ones to at least try some spinach. Thanks for this. Nina - What do you mean "mind"? I'd love if you tried them! These look really wow, have to try them soon. I would also make my own mince rather than get something dodgy! oohh! these look awesome! perfect little snacks! LadyRaven - Isn't it just scary? Much better to make ones own as far as possible. Tandy - Logic prevails all round it would seem! This looks absolutely heavenly! YUMMO!! These are so pretty and I love the idea of meatballs that are full of veggies! I definitely have to give this recipe a try! I'd much prefer a side of Greek God/Adonis to go with my spanokopita. But other than that MINOR contention, these look fantastic! Spanakopita never fails to make me happy. Have you tried making them without feta? Or is there an alternative to feta, I can't eat dairy. Joanne - If I see a Greek God on this side, I'll send him over, stat. Paula - Thanks for stopping by! Lovely to have you. Spoon & Chopsticks - Yup, these would be great to nibble on while watching a game. Anonymous - I haven't tried making them without feta actually. I would suggest adding 1 more egg and a handful of extra breadcrumbs to make up for the loss of moisture from the feta. Also, up the salt. De-li-cious!! Those looks so tasty! Perfect for appetizers at a dinner party. What a great idea! These will definitely be on our table soon. I also agree with Chef-ette, perfect for an appetizer for a dinner or cocktail party. Oh man, that sounds very, very yummy! I'm a fan of the good old meatballs, so these will have to be tried out one of these days! Yum! Those look absolutely fantastic - so pretty even! You know, you joke about veg peeling classes, but when I was training as a chef, I could wield large knives with very little damage to personal safety BUT that pesky veggie peeler inflicted more damage on my skin, fingers and finger nails than any knife! They're scary! The Chef-ette - Yes, these would be fantastic as appetizers or tapas style evenings even. Lori - Hope you enjoy 'em! Juanita - Yup, vegetable peelers are dangerous! Going to modify this for a "meat-off" with a friend of mine who is doing Grape Jelly Meatballs. I dislike the taste of red meat so I figured I'd modify this a bit to make them more Italian. Going to use mozzarella instead of feta and oregano/basil/parsley instead of Greek seasoning. Then serving over penne rigate with a homemade Alfredo sauce :D Thanks for the recipe! Loving the Italian spin! Think it'll taste superb. Do let me know how they turned out. Is chicken mince cooked chicken meat or uncooked? Can't wait to make these !! @LunaSea - it's uncooked. Ground chicken basically.